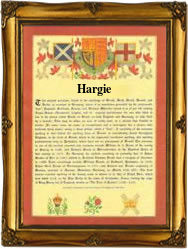 Recorded as Hargie and Hargey, this very rare surname is English. It derives from the Norman-French locational and perhaps job descriptive name Argent or Argeus meaning one who lived or worked at a silver mine, or who came from one of the several French villages called by the same names. There are a number of variant forms including Argo, Harg, Hargess, and Hargerie. The name development and recordings include Maria Hargie recorded in Stepney., London, on September 8th 1859 and again on April 13th 1864 when the spelling had changed to Harrgie! It is interesting to note that the first recorded name holder married his wife Elizabeth Auston during the Great Siege of York from April to July 2nd 1644. The first recorded spelling of the family name is shown to be that of Robert Hargerie, which was dated June 7th 1644, married at Holy Trinity Church, Mickiegate, Yorkshire, during the reign of King Charles, known as the Martyr, 1625 - 1649. Surnames became necessary when governments introduced personal taxation. In England this was known as Poll Tax. Throughout the centuries, surnames in every country have continued to "develop" often leading to astonishing variants of the original spelling.